Congratulations, you’ve reached the end of the line! It’s been a hard journey, no doubt, but one which will serve you well in the future. Once you see the benefit of a flexible and mobile core muscles, the relief to your back now that it has a proper support, you are likely to continue with at least some aspects of this program well into your twilight years. 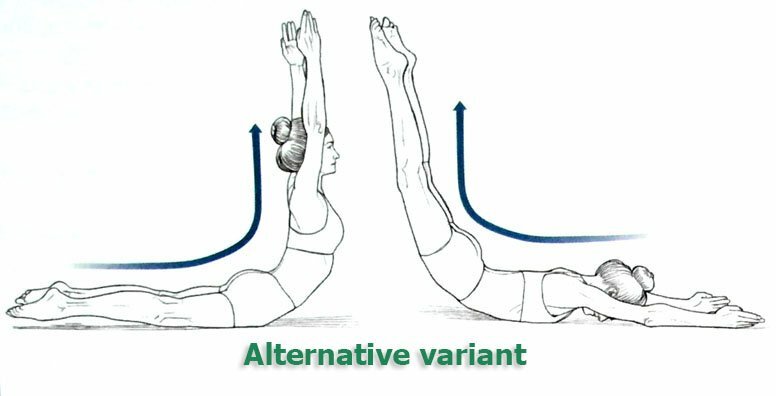 Today’s exercise, Pilates Swan Dive, will increase muscle tone and endurance on muscles important for your back and posture. As previously mentioned in the series, make sure you gradually advance through the exercises and consult your doctor if this program is right for you. Initial position. Lie on your stomach and leaning on the arms, lift your chest off the mat. Elbows should be pushed forward and placed wider than shoulders and the hands should be touching. Legs and toes are extended. Breathing in, roll back into the intended position. Repeat 5 times, accompanying the rolls forward with exhalation, and the rolls back with inhalation. Just like with the Stomach Rolls, maintain a mental image of the head, torso and hips in the form of a rocking chair, rolling on the floor. Swan Dive can also be performed by raising his hands above the head rather than keeping them wide apart, as shown in the illustration above. The same hand position is maintained on the reverse roll as well. This increases the load of spine extensor muscles, but also helps to maintain a uniform curvature of the spine during the rolls. 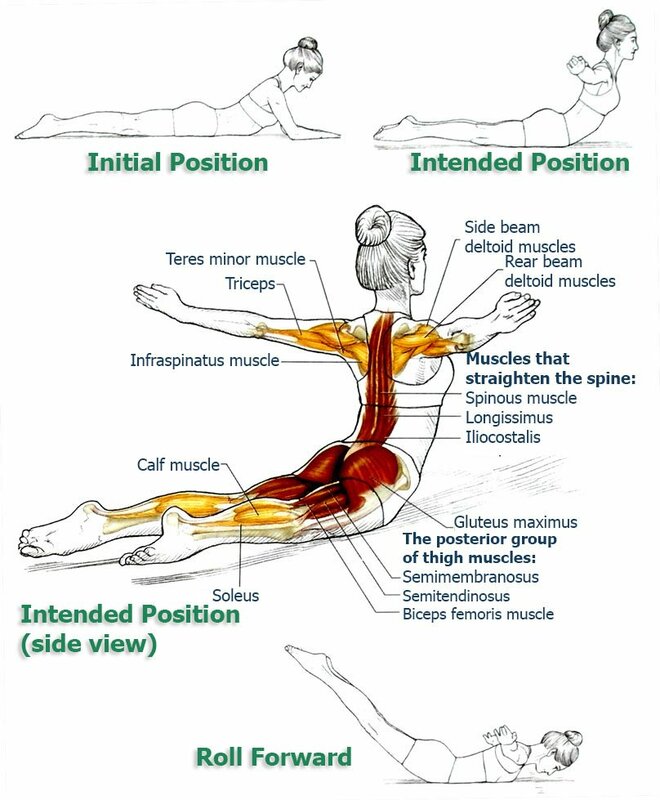 Pilates Swan Dive increases tone and muscle endurance of the spine and leg extensors. The aim of the exercise is similar as with the Stomach Rolls – maintaining a balanced position of the spine when performing various body movements in space. However, the level of difficulty is much higher, because there is no support from the hands. In this regard, intensive work of many different muscle groups is required, including the abdominal muscles, which reduce the burden on the waist during the hyperextension of the spine. This exercise should only be done after you have sufficiently mastered the simpler exercises of the program. Even if you managed a technically correct execution, the degree of hyperextension of the spine may be too high for some people. You should refrain from this exercise if you have medical contraindications. Because of the difficulty, it is recommended to start the exercise with reduced rolls height, in order to avoid risk of injury. In the state of maximum extension, the exercise performs dynamic stretching of the spine and leg extensor muscles. With the Swan Dive we conclude our exercise program aimed at strengthening your back muscles. With regular practice, these exercises will help you get relief to your back and give you an optimal posture during demanding activities. Start from the beginning of the program and give yourself time to master each exercise before advancing on the next. When you complete the program, you can do the whole set of exercises before going to bed, or after waking up, for a strong and flexible back. Thank you staying with us this far and hope you have fun with our program. If you’ve enjoyed this program, make sure to check these two programs, which continue the series: Exercises to Improve Flexibility and Movement Precision of Your Back & Spine and Abdominal Exercises for Spinal and Core Movement and Stabilization. Remember, sharing is caring! Cheers! Melissa Bell has a strong background in nutrition education, fitness and yoga, and experience working on specialized stretching, bodybuilding and weight loss programs. She is actively studying Japanese, doing research and travelling for conferences while taking care of two children. How does your body react to mental illness?